Flavor Text: He specialized in the unusual, the rare, the weird. No one knew where he got his items, but he always seemed to have just the thing to tempt you. And card cycling never hurts. 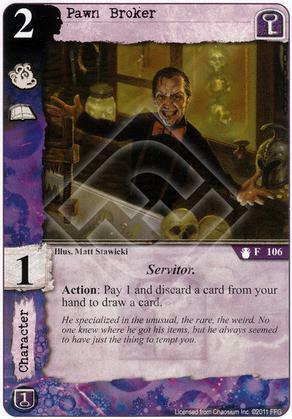 I love Pawn Broker in my Shub/Yog Dark Young deck. He can discard Dark Young to hopefully draw more Dark Young, which are then discarded to hopefully draw more Dark Young. Once Shub-Niggurath (The Cacophony) hits the table (via Under the Porch perhaps), all the Dark Young that the Pawn Broker discarded and drew are born. Yeah, it's a lot of pieces that have to come together, but Pawn Broker is pretty good at bringing combo pieces together. And Shub is traditionally one of the factions that needs lots of time, so nothing new there. Pawn Broker and Shub-Niggurath 2.0 were made for each other.